S.P.O.C.K (Star Pilot on Channel K) is a synthpop band from Sweden formed around 1988. The subject matter of S.P.O.C.K's songs frequently centers on science fiction and, in particular, Star Trek. Their most recent release is: "2001: A S.P.O.C.K Odyssey" since then the band seems to be on hiatus although they still do gigs once in a while. The original lineup of the band were songwriter Eddie Bengtsson (formerly a founding member of Page), Finn Albertsson, and vocalist Alexander Hofman. In 1988 Eddie Bengtsson wrote a handful of songs to be performed at Finn Albertsson's next birthday party, with Alexander Hofman performing vocals; the three men dubbed the band Mr. Spock (named for Mr. Spock of the Star Trek franchise). After the performance at Albertsson's birthday celebration, the band continued for several months to play at house parties, and soon managed to secure some event bookings. In 1989 the band members contacted Paramount Pictures for permission to use the name "Mr. Spock." When Paramount demanded compensation for the privilege, the band renamed themselves Star Pilot on Channel K, abbreviated S.P.O.C.K. S.P.O.C.K's commercial success began in 1990 when the Swedish record label Accelerating Blue Fish published Silicon Dream as a limited-edition single. 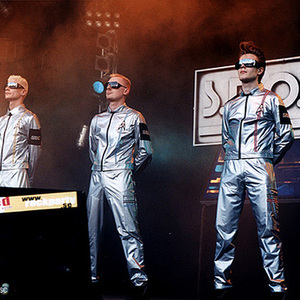 On stage the band members adopted sci-fi-esque personae, with Eddie Bengtsson as "Eddie B. Kirk", Alexander Hofman as "Android", and Finn Albertsson as "Cybernoid". Together with such bands as Page, Elegant Machinery, Sista mannen p&aring; jorden and KieTheVez, S.P.O.C.K helped to define the sound of the Swedish synthpop movement. Representative songs include Never Trust a Klingon, In Space No One Can Hear You Scream, Mr. Spock's Brain, and Astrogirl.